The music and dance is interspersed with a spoken cultural background narrative, explaining the instruments' origins; describing the dances; the meaning of the songs; the history of figure and stepdancing which link to many other folk traditions. 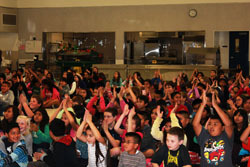 The program includes interactive rhythm games and participatory singing and dancing. It adheres to California Content Arts Standards. 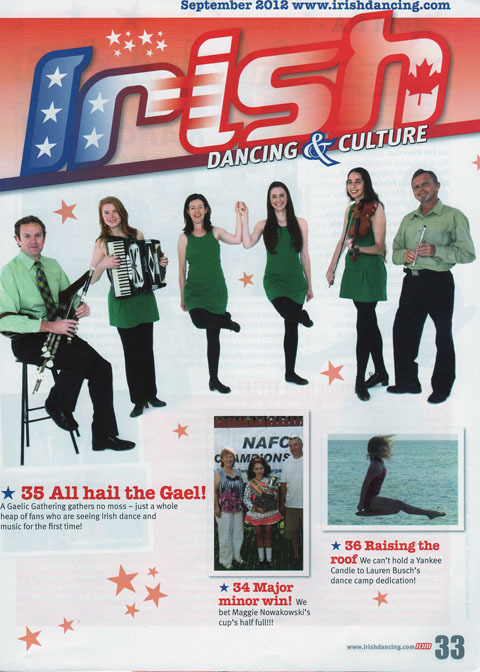 Participate in an Irish Dance to live music onstage! 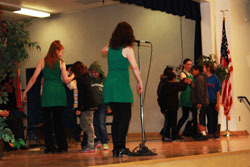 Join in lilting to an Irish song! Máire Clerkin - Artistic Director from London, dancer, choreographer. Teacher / Adjudicator with An Coimisiun le Rinci Gaelacha; writer-actor, performer of one woman show; founder of UK theatre companies The Hairy Marys, Clerkinworks. Directs drama projects for Irish Dance academies nationwide. 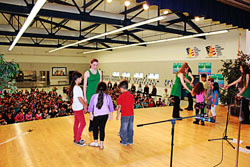 Teaching Artist with Los Angeles Music Center and Segerstrom Center for the Arts. Patrick D'Arcy - musician from Ireland. Uilleann piper, whistle, and bodhrán player. Partick has appeared on numerous recordings over the years in all genres of music and has written music for TV. He recently played whistle on the score for the motion picture "Snow White & The Huntsman" for composer James Newton Howard. Since 2010 he has had the privilege to tour extensively from The Waterfront in Belfast to The Grand 'Ol Opry in Nashville with modern hymn writers Keith & Kristyn Getty. This summer he released his debut solo album "Wallop The Spot" to critical acclaim. His credit list includes some familiar figures including Bono (U2), The Kennedy/Shriver Family, Quincy Jones, Daniel Lanois, Oprah Winfrey and David Foster. Kira Ott - Music Director from Southern California, musician, fiddle, vocals and dancer. Performed at the Ford Amphitheater, Loyola Marymount University, UCLA, and the CTMS Solstice festival where she taught fiddle workshops; numerous festivals in Ireland. 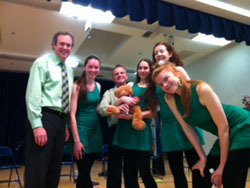 Jonathan Presley - Dancer, native of Fresno, California, international Irish Dance competitor since 2004. He trained at the McTeggart School of Irish Dance for ten years under Maureen Hall, and in 2011 co-founded the Irish dance club, Gra Ag Rince, at Cal Poly, San Luis Obispo. Alice Ryan - trained at the McTeggart School of Irish Dance under legendary teacher, Maureen Hall. A graduate of The Pacific Conservatory of the Performing Arts, she is a company member of Theatre Banshee. Alice sings and dances with Irish bands, The Rolling Wave, Blackthorn Aire, and The Sweet Set. Frank Simpson - musician, native of Dublin, Ireland, is an award-winning musician who enjoys performing the colorful tradition of Irish music on wooden flutes and whistles. Durfee Foundation Master Musician Fellowship, 2006; Wind Instruments Director for Solstice Festival. Moira Smiley - musician, vocals, accordion, from Vermont: works internationally as composer-vocalist; leads visionary vocal band, Moira Smiley & VOCO; travels the world as a soloist in early & traditional music and creates new work with dance, theatre & film. Owen Barrington - Hailing from his hometown of Anchorage, Alaska, Owen Barrington began dancing at the relatively late age of 12 and by age 15 began his competitive Irish dance career under the instruction of famous teacher, adjudicator and choreographer Tony Comerford A.D.C.R.G. In spite of his late start, he became the first Alaskan to reach Open Champion status and the first to qualify for the World Irish Dancing Championships. In 2005, Owen joined the internationally acclaimed touring show "Riverdance" and has since performed all across North America. Tara Barry Phelan - is from Cobh, County Cork. Having toured the United States as leading lady in Riverdance for six years, Tara married and settled down in Redondo Beach, California. Twice crowned World Champion and six-times winner of the All-Ireland Irish Dance Championships, with Cowhie Ryan School, Tara nowadays coaches dancers nationwide and is in high demand for her outstanding choreography. Michael Patrick Breen - dancer from Ireland and England. He is an actor, Irish dance teacher and choreographer; team titles in Irish Regional and four U.S. National Championships; Southern California Men's Championships. Helen Donnelly - dancer from Los Angeles. Former Open Champion from the olden days before wigs. Performed extensively with the band Ciunas and appeared at the Ford Amphitheatre and the Queen Mary; she is currently studying for her TCRG Irish Dance Teacher's exam. Jennifer Keogh - dancer from Dublin, Ireland; silver medalist All Ireland finals, lead dancer Tribute to Maureen Potter, RTE television, Dublin. Qualified masseuse and makeup artist. Megan Kirk - Megan competes in Irish dance with the Aniar Academy of Irish dance, under the direction of Christine Byrne, T.C.R.G. She has competed at regional, national, and world championships, and has placed 4th in the region, and 24th in the nation. 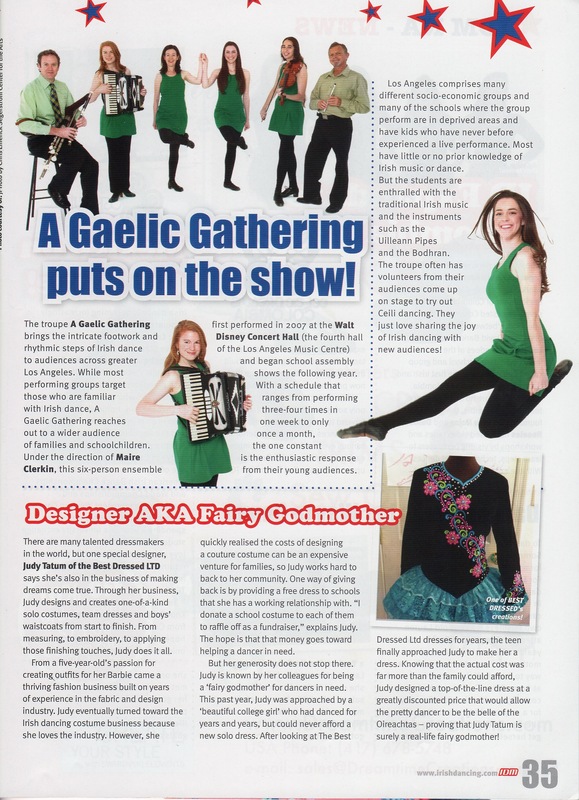 Megan is also currently dancing in the Irish dance show sensation Celtic Legends, and has toured with them across the US, France, and China since early 2009. Jimmy Murphy - musician from California, guitar, mandolin, vocals. 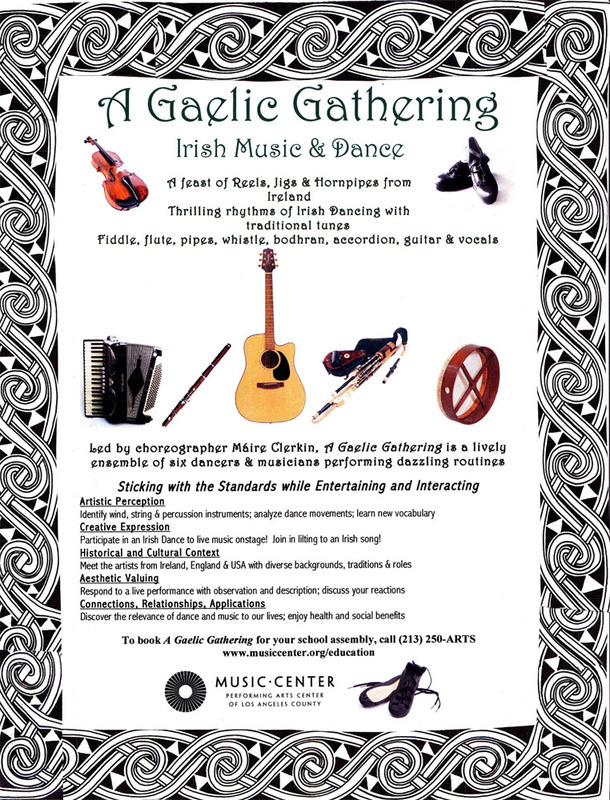 Traditional Irish guitarist, he performs, teaches, and plays in sessions throughout the greater Los Angeles area. International residencies in Japan for Walt Disney Company and Universal Studios. 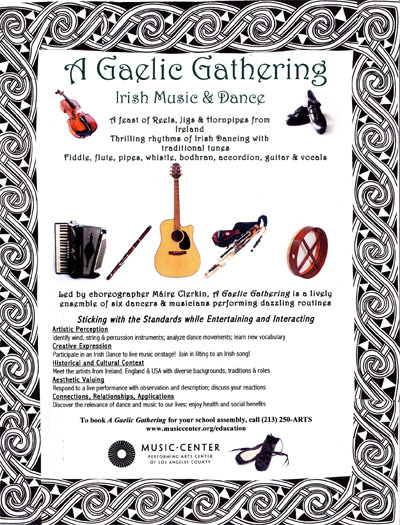 A Gaelic Gathering is available for school assemblies, concerts, recitals and parties. 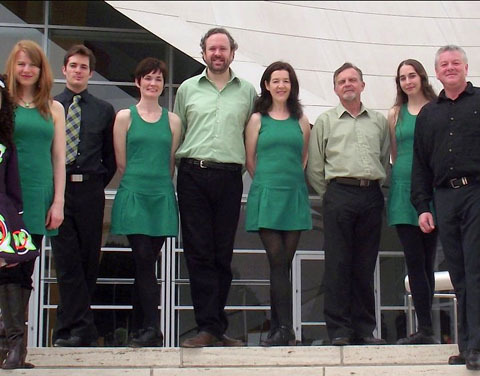 The group can also be hired in tandem with Máire Clerkin's school workshop programs in Traditional, Rhythmic & Creative Irish Dance and Irish Dance Drama.